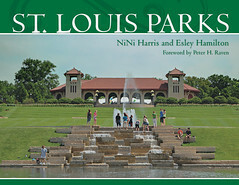 “The firm of Emil Frei, Inc., founded in St. Louis in 1898 and still operating today, has been one of the leading companies in the field of stained glass and mosaics in the United States. Founded by Bavarian-born artist, Emil Frei, Sr., (1869-1942), Emil Frei, Inc., has remained a traditional-style association of craftsmen and artists under the leadership of three generations of Freis, each of whom has made and overseen major artistic contributions to the field of stained glass and / or mosaic design, especially in the realm of the liturgical arts. — from "EMIL FREI, JR., COLLECTION REGISTER" by Martha Ramsey; as quoted on the Emil Frei company website. 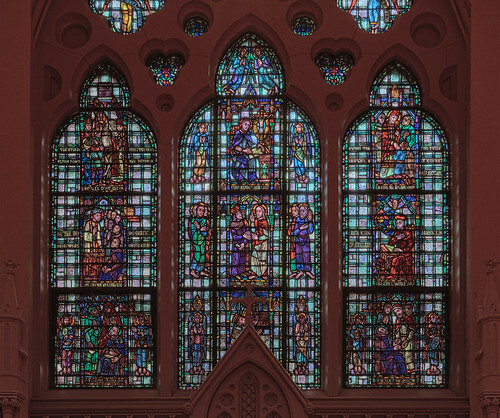 The windows at Saint Francis Xavier Church at Saint Louis University are among the greatest of the works of Emil Frei Jr. 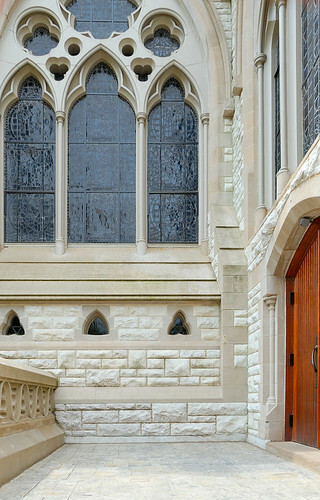 The windows here have strong blue tones, inspired by the Cathedral of Our Lady of Chartres. 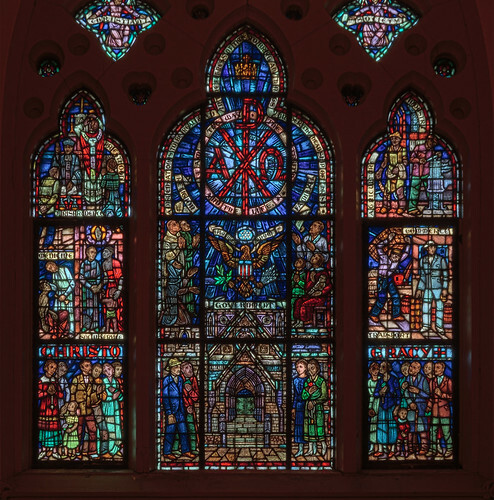 The windows have an exceptional amount of detail, and are worthy of a long catechesis and history lecture. The central figure is of Christ meeting the scribes and Pharisees. Christ teaching. 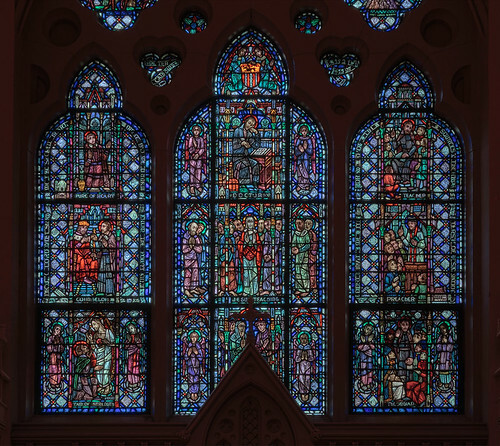 These windows are exceptionally beautiful, and yet are exceptionally difficult to photograph well, because of their fine detail and wide range of saturated colors. 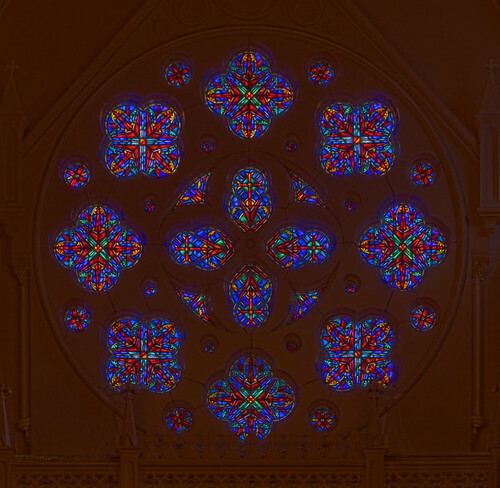 The rose window above the choir loft has a saturated blue color, much darker than the other windows. This photo doesn't do the window justice. You have to visit yourself. Christian society - Christocracy. 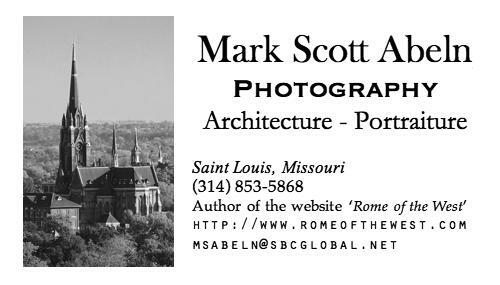 The symbols of the Republic are surmounted by the monogram and crown of Christ the King. Saint Francis Xavier has weekday confessions from 10:45 a.m. to noon. 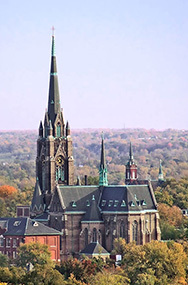 The day I went, two priests were hearing confessions; I would recommend going early, sometimes the lines are long. That is some incredible stained glass! I agree photos don't generally do the stained glass any justice. You really have to visit it yourself. I've always wondered how long it would take to make one of these church stained glass windows. They see so complex and so beautiful!